Happy Feast of St. Joseph to everyone! 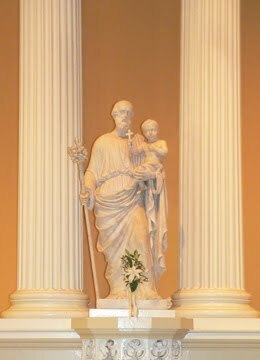 This particular image of St. Joseph is from Old St. Joseph's Church in Philadelphia, PA, where Mark and I went as part of our first date, and also where we went right after he proposed. It has quite a special place in our hearts, for obvious reasons as well as for reasons I'll have to tell you about some other day. The prayer is one we chose for our family and had printed on holy cards with this picture for our wedding day. 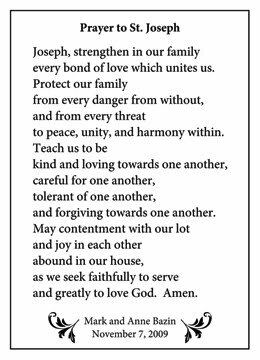 In our rush to leave for the honeymoon, we forgot to take any copies of the prayer with us, and so I don't remember to turn to this prayer often enough, but wanted to share it with you and your families. What a special prayer for your family! Just found your blog! Happy feast day! !